Mulder: Ohoy! Hey you there! Someonee! Please help me. I can´t drag her all by my self. Shes not a light person. Scully: Ohh. I fainted because you had that awfull aftershave again. The Rest Of The Batch! Mulder: scully Quick, there's no one around, get your gear off. Scully:  Ohhhh Mulder help me, I can't wait. I smell THAT bad? Maybe we can take a shower....TOGETHER! down by lifting my arm.......". Mulder: Err.. Billy, my aftershave.. its done it again! Mulder: God, it's great being superior to Russel Crow. Mulder: Scully quick there's no one looking. 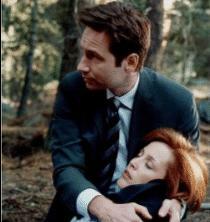 Scully: ok Mulder I'm ready kiss me. Officer off screen: What is wrong with Agent Scully? Mulder: We just solved the mystery of the Horny Beast. Can I get a rootbeer?